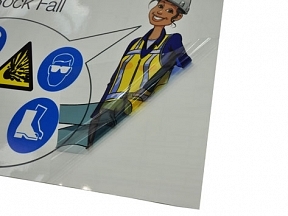 Clear Self Adhesive Vinyl has many applications, it can be used on glass or it can be used on white surfaces. 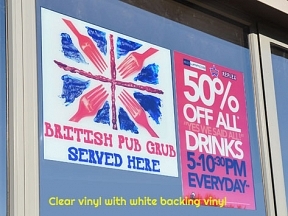 We don’t recommend using clear vinyl on coloured surfaces as the surface colour will distort the colours in the print. 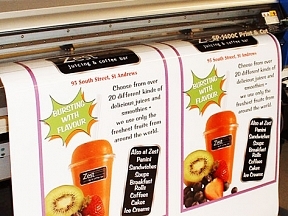 When using on glass a mirrored print works best, fitted inside to view outside. 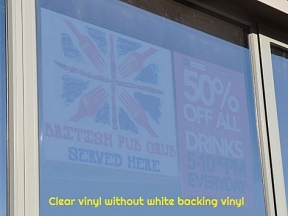 The print is both transparent (see through) and translucent (lets light through), if you wish to block vision and make the colours stronger from the outside, we advise you to cover your print with a white backing vinyl (fitted separately) over the top of your clear vinyl print, if you order this using the options below, we will correctly size your white vinyl cover sheet to match your clear vinyl print.